Tummy time – babies either love it or they hate it. Some babies are happy and content playing on their tummy. Yet others will start crying as soon as they’re placed on their tummies. But is it really important, especially if your baby doesn’t like it? And if so, how can you make it more enjoyable for your baby? You can start tummy time any time after your baby is born. Lie back, place your baby on her tummy on your chest, and enjoy some skin-to-skin under a blanket. As she tries to lift her head so she can gaze into your eyes, she’ll be starting that important process of muscle development. You should only ever attempt tummy time when your baby is happy, alert and contented. If she’s grumpy, she isn’t going to enjoy tummy time and it’s likely to end in tears. If your baby cries or shows any signs of discomfort, it’s time to pick her up. You can try again later when she’s in a better mood. It’s hard work for babies to strengthen all those muscles, so she might tire easily. You might only manage a few seconds on your first attempt, but this will gradually increase as your baby grows stronger. Tummy time allows your baby to build strength and develop control of her head and body. Babies learn to control their heads first, then their shoulders, and then all the way down to their toes. Tummy time gives your baby the opportunity to strengthen the muscles she needs to prepare her for rolling, crawling and walking. It also helps with fine motor skills and co-ordination too. If you use toys to entertain your baby during tummy time, she’ll also be working on her fine motor skills as she tries to reach out and grab them. This kind of play is also good for her coordination, as she masters how to get her arms to reach out to the toy. Tummy time is also important because it reduces the amount of times babies spend on their backs. Tummy time helps to prevent flat spots on babies heads (known as positional plagiocephaly or flat head syndrome). According to the American Academy of Pediatrics, positional plagiocephaly has risen from 2% to 46% since the introduction of the Back to Sleep campaign in 1992. Though on their backs is the safest place for babies to sleep, it’s important to reduce the amount of waking time they spend in this position. Babies have softer skulls than adults. Therefore, lying in one position for too long can actually change the shape of the developing skull. Putting your baby on her tummy for playtime is thought to help the skull to develop correctly. Talk and sing to your baby to reassure her – she loves the sound of your voice. Your baby feels safest when snuggled up on your chest, so it makes sense to start there. It reduces the risk of your baby getting upset, and means she has some great motivation for lifting her head up (seeing your smiling, loving face!). Having tummy time on your chest is a great option for very young babies. Tummy time on your chest will work just as well for strengthening muscles and developing muscle control and motor skills. Babies need a firm surface in order to push themselves up during tummy time. With a blanket or baby mat on the floor, place your baby on her tummy. Floor mirrors are a great prop for tummy time on the floor. Your baby will be fascinated by her reflection, and will try to lift her head to see herself. 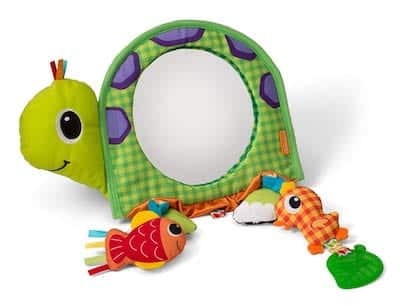 This mirror (Infantino Discover and Play Activity Mirror) is one of the top rated floor mirrors on Amazon. Lie your baby on her tummy on your bed. Her head should be near the edge, and her body should be safely toward the centre of the bed. From that position, she should have a pretty good view of the room. 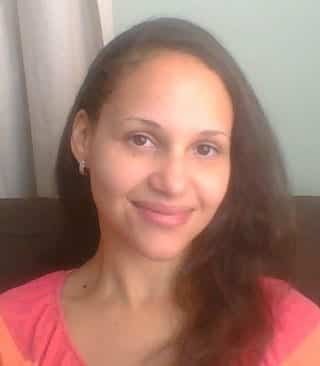 Sit on the floor in front of her and chat to your baby! Sitting on a sofa or chair, you could try laying your baby across your knees for tummy time. She’ll be able to see quite a lot from up there, and you will be able to soothe her by gently stroking her back. As your baby gets older, around four months of age, you can get a little more adventurous. Lie on the floor, with your legs together. Lay your baby from your knees to your feet, so that she’s facing you. Make sure you’re firmly holding onto your baby so that she’s secure. Now try lifting your knees of the floor so that the baby is ‘flying’. This is a great solution if nothing else seems to be work. Or, if you want to avoid all the stress of tummy time and skip to what works for lots of parents! 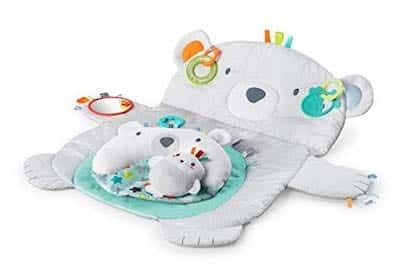 A tummy time mat might be the answer to helping your baby enjoy being on his or her tummy. This Bright Starts Tummy Time Prop & Play is Amazon’s #1 best seller in the baby mats and gyms section. As you will read in the reviews, plenty of parents wrote that their baby absolutely hated being on their tummy. But with the help of this mat, they were able to make fast progress. Spending time in a stretchy wrap snuggled up against your chest can help build baby’s neck and shoulder muscles. 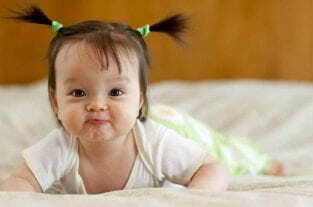 Your baby will jiggle around to get comfortable and reach her head up to see you. Doing so will strengthen her muscles in the process. And because she’s upright, it will help avoid flat spots on her head. Make tummy time a regular part of your routine. Try a few minutes after each nappy change. Place your baby on something comfortable. A baby mat or blanket on the floor are both good options. Hardwood flooring isn’t, because your baby could hurt herself. Short tummy time sessions daily. Make sure you allow for a few short sessions each day. Initially your baby might last 5 minutes, but in time that may increase to 15 or 20 minutes.